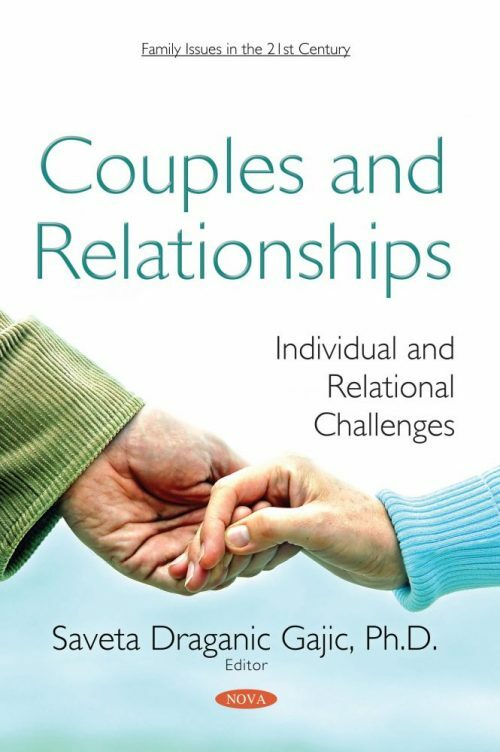 Couples and Relationships: Individual and Relational Challenges discuss the complex connection of individual factors (the personality of a partner) and the couple`s relational dynamic from different theoretical and therapeutic perspectives. It takes into account the influence of context (culture, social factors) and personality traits in the assessment of a couple, as well as a review of multiple levels of intervention (from individual to relational therapy) in the therapeutic approach. The topics are processed in line with the latest advances in psychology, psychiatry and psychotherapy, with an emphasis on the need for connection with the practice itself, along with guidelines for experts with different profiles who are working with couples. The content of book cover further the following themes: Relationships – the chances and challenges for an individual (the focus concerns the meaning of love in relationships, specificities of so-called “healthy marriages”, components and mechanisms of healing and the destructive power of relationships, as well as the relational problems connected with it); the individual – the chances and challenges for a relationship (the relationship between the personality structure and a partner’s choice, and the dyadic relationship); diagnostic dimensions in the appraisal of couples in crises (the influence of personality traits, personality disorders and attachment style on the couple’s relationship); therapeutic approaches and possibilities during work with couples in crisis; and the education of experts in the treatment of couples. The modern age, with its varying perspectives on the understanding of the phenomenon of closeness and love in a relationship, presents a challenge not only for the couples, but for the experts dealing with couples in crisis as well. The authors believe that integration of multiple levels in the assessment of a couple (from intrapsychic to the relational), as well as different approaches in couples therapy today, are a necessity which requires significant flexibility to go along with the knowledge and experience of the therapists themselves. This book is meant for experts of the new age who are working with couples (psychotherapists, psychologists, social workers, psychiatrists, etc. ), taking into account contemporary partner themes and gives guidelines for professional and personal development of an expert faced with the challenges of the individual, relational and cultural context in a partner dynamic and the therapeutic approach of a couple. The authors have a rich clinical history of practice in working with individuals, individual psychopathology, working with couples, and the education and training of students of medicine, psychology and education in systematic family therapy. Apart from that, the authors are university professors, as well as authors of numerous publications printed in foreign and domestic magazines as well as university textbooks, with decades of experience working in a common multidiscipline team.